Home made ukulele — from match-sticks! The Horsham Times reported, on 2 December 1932, that some people take recycling too seriously. 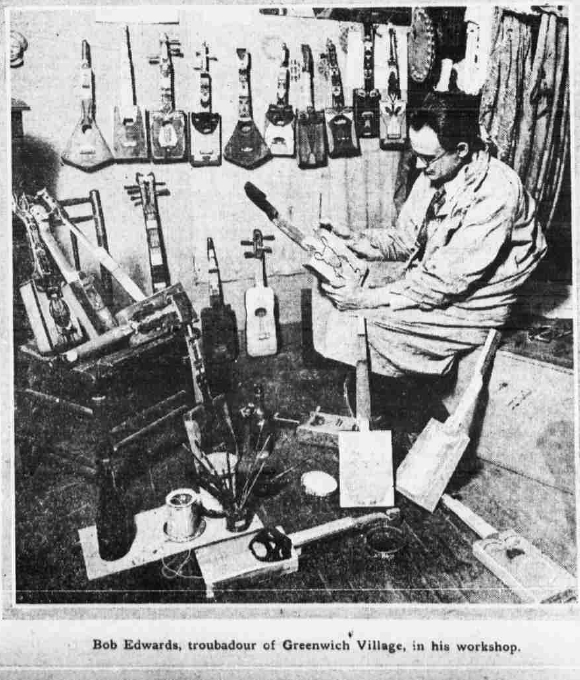 Mr. Donald McDonald made a ukulele from used match-sticks, complete with ivory bling from a hair clasp. It took 200o match-sticks to complete the project. I hope Mr. McDonald wasn’t a smoker. A more recent attempt (and a pretty good looking one) may be seen here. A ukulele belonging to Corporal Harold Smith, who was one of the Rats of Tobruk, was found after his capture and presented to his parents, according to the Perth Daily News of Wednesday 21 April, 1943. The ukulele had been decorated with three drawings of rats together with the word “Tobruk”. Members of his unit from officers to privates wrote their names on any spare wood of the ukulele, totalling some 200 signatures. Ned Ducker was the one who recovered the uke and returned it to East Fremantle. Front page news for the Perth Mirror on 8 October 1938 — the old story of one pretty young woman, and two young men. The young woman, who was a fine musician, was taken to a dance by one of the two. On the way home, the other fellow rushed up and angry words were exchanged. There was a bit of pushing and shoving at first, but then the ukulele came out and it was vigorously applied to the rival’s head. In reply, the other fellow produced his guitar, and the battle was on. After the splinters and dust cleared, there remained on the field of honour only the two bruised young men. A third hopeful had come by and escorted the young woman home. I had the privilege of seeing the Ukulele Orchestra of Great Britain, live in Brisbane last night — from a front-row seat. It was a very fine performance from exceptional ukulele players (and singers, and whistlers). I was a little surprised to see that most of the UOGB used plectrums (Plectra?) instead of the finger method during the evening, although there were some nice examples of finger strumming from time to time. I enjoyed the entire evening, but I was particularly impressed by the five players of one ukulele (each additional player adding meaningfully to the melody produced on the uke), and the Russian take on ‘Leaning on a Lamp-post’ as George Formby never did it. Those of us who brought our ukes along got to play Beethoven, and I took the extra opportunity to wear my “Doesn’t Play Well With Others” T-shirt. If you get the chance to see the Ukulele Orchestra of Great Britain, I recommend that you take it. I’ve used Tasmanian Oak for the neck, as it comes ready squared and sized (just need to shape). Maple is so much more expensive. I think it still sounds ok.